In 2016, I received the word risk. In the middle of 2017 I gave away that word. In the final days of 2017 I am learning to accept and embrace a new word. Like most people in the final days of a year, I was feeling nostalgic and reminiscing on everything that God has and is still doing in 2017. My favorite way to do that is to scroll back through Twitter feeds and Instagram posts to put words, faces, and hashtags to the memory. This year was nothing short of lots of Disneyland, roadtrips, hard conversations, being called out, laughter, meeting new friends, new relationships, and the beginning of a lot of healing which led to the word free. In all honesty, I didn't want this word, like, at all! I knew what was attached to it and I was okay with where I was at, or at least that was what I kept telling myself. I have convinced myself for years that freedom was not an option for me, I convinced myself that my brokenness would always hinder the freedom that kept being poured over me, taught to me, and shown to me. You see I can stand on a stage one day, speak truth and freedom over students that come through our doorway and believe with my whole heart this is what God can do...for them. Not for me. Lies from the enemy have filed my head and heart for too long. "You are too broken." "You are nothing." In the words of the Hillsong team and Taya Smith, it's time to let the devil know not today. Freedom is on the horizon, not just for me but for all of us. Let's let 2018 be the year of finding freedom, finding healing, and finding joy. It's time to stop running in every direction other than Gods. His arms are wide open and ready to embrace anyone that is willing to run to them. As followers of Jesus, we are called to put our faith into action. But what does that really look like in the form of a conversation? 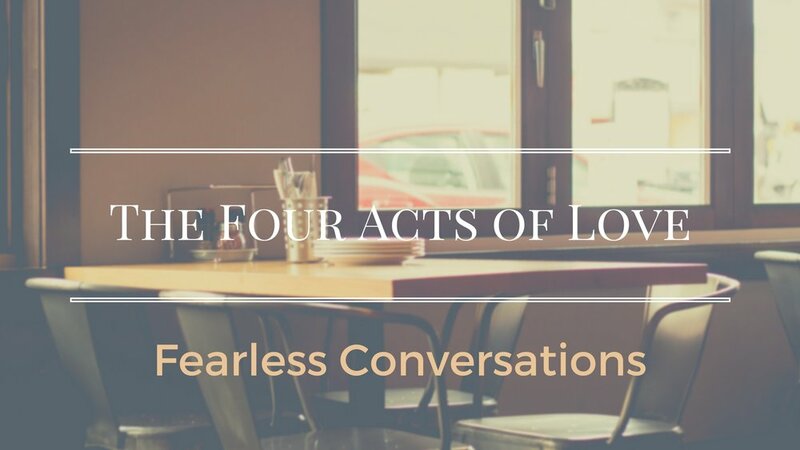 Being willing to have fearless conversations open doors to what God is doing in not only other people's lives but also ours. Fear has been my suitcase since before I can remember, I have always carried it around, and as I've gotten older, it's become heavier. As a kid that suitcase was filled with fears like snakes, spiders, heights, things that I eventually conquered and was able to remove from my suitcase and leave on the baggage claim. It seems however, as I dumped one, I gained two. This isn't uncommon for myself or even you too for that matter, but fear is something we all deal with.